Southwest Missouri had 10 to 14 inches of snow...depending upon who you ask. (The public works guys measured 10 inches). 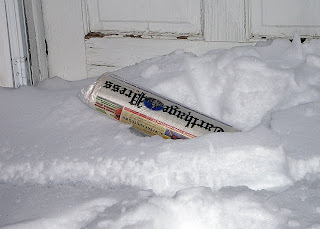 I had a snow day on Thursday, and then on Friday, as I was getting ready for a second one, when the Carthage Press sent out an SOS...Davison was snowed in in Joplin. So, the two of us switched places for the day....I'm not sure how much Davison could do, since he was snowed into his neighborhood. 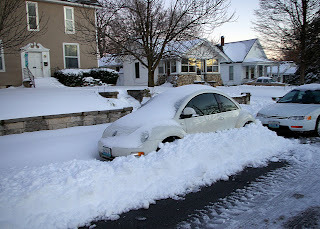 I've got a few pics of the snow (I was carless until this afternoon, when my brother and his friend helped dig me out). 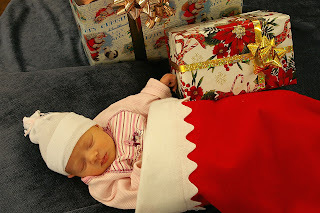 Anyway, I spent today at the scrapbook store taking santa pics. I think this one, with Karen's granddaughter is my favorite. We had a few "takers" even though the weather was still crazy.